The AmeriGlide Hercules II 600 Residential Vertical Wheelchair Lift has an outstanding 600-pound carrying capacity. 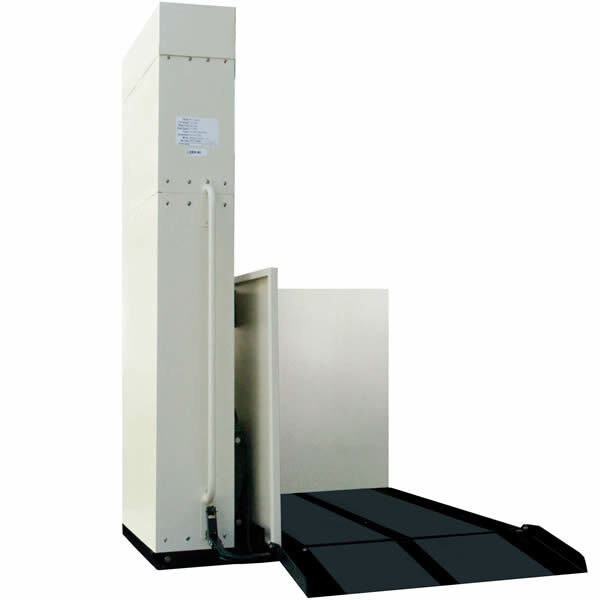 This lift starts at a 53-inch height and can be upgraded to various heights up to 149 inches. 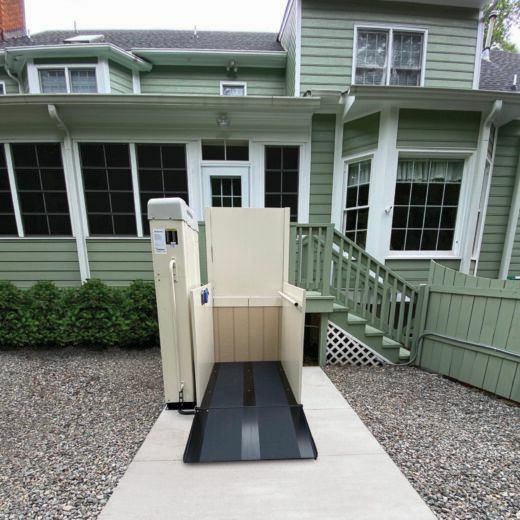 The AmeriGlide Hercules II 600 Residential wheelchair elevator provides a safe, reliable way to lift individuals up and down around your home at a very affordable price. 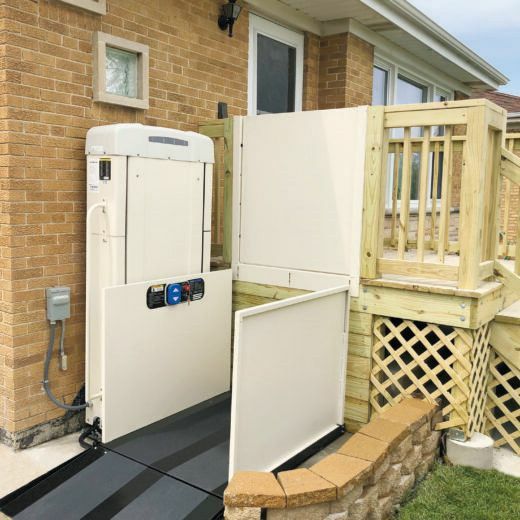 This residential vertical wheelchair lift arrives mostly assembled, meaning you can have it fully assembled in less than an hour. And then installation is little more than setting the wheel chair lift in place. 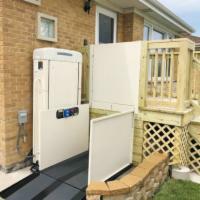 Check the installation section of our residential wheelchair lift guide for complete more information. You may initially intend to use the AmeriGlide Hercules II 600 Residential outside of your home or on the inside. 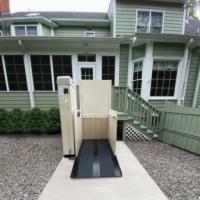 Regardless, this wheelchair lift is constructed to handle any environment. We don't just sell price, although our prices are the best anywhere. Our AmeriGlide vertical platform lifts are manufactured to our specifications to meet our strict quality requirements. 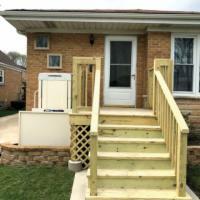 For the best result, and to make your residential vertical wheelchair lift plans a lot easier, you may want to review our residential wheelchair lift buyer's guide. Any of our residential vertical wheelchair lifts can be built to your specifications and priced based upon height, and any additional options you may require. Taking delivery of a residential wheelchair elevator lift that exceeds 72 inches in height requires planning and an understanding of the process. Our buyer's guide for residential wheelchair elevator lifts has a section which explains these requirements as well as many others. We also offer free phone consultations at your convenience. Call 1-800-470-8940 To Speak With Our Residential Wheelchair Lift Specialist For Information And Your Free Custom Blueprint. Guard Panel 36", Optional 42"
What Vertical Height Does Your Lift Need To Reach? Extra charges only applied when elevator lift is delivered fully assembled. If your lift is taller than 96", it is required to have a gate or interlocks installed. JimM from Baltimore, Maryland would recommend this to a friend. Well made.All parts fit well. Easy assembly. Assembly instructions are not very detailed. Assembly photos are poor in quality. Picked up at trucking terminal and Installed myself. Unit is very heavy.Assembly instructions could be improved. For instance-It has you install all the bolts in the side panels only later you have to remove them on the folding ramp end to install the ramp brackets.No clear direction as to what to do with the bottom call button or the loop of extra wire for the optional gate controls. Thank you for the review Jim. We're taking a look at the installation instructions to see where we can make improvements. We appreciate the constructive criticism! Glad you're enjoying the product. Mark the Shark from Brockton, MA 02302 would recommend this to a friend. It was delivered with out issue sooner than expected. It took 3 people to get the unit in the house and only 2 of us set it up in bout 3 hours, It was preset in the factory and I did not have to do any adjusting. I had to remove the platforms legs (2 bolts) to get it on the 32 inch doorway. It was about 800lbs but it did not feel that heavy when we installed it, They could send better instruction for setup. Great product my mother uses it every day and it is no longer a big deal to go up and down the stairs. She uses a walker and very simple to walk on lower/raise and walk off. Son-in-law from Atlanta, GA would recommend this to a friend. Shipping was very timely and all sales were handled very professionally. Installation went well, for a first timer, do-it-yourself type. Had to make some field condition adjustments on the wiring and the battery backup was not included in the shipment. Very functional. Definitely a better option than using an extensive supply of ramps.